Printing at an ultra-fast 63 lps, the TM-H6000III offers highly customised colour receipts in an instant. With advanced graphic and barcode capability, you can include high-quality logos and promotional messages to turn your receipts into a powerful, live medium for communicating with customers and enhancing your brand. This printer has a large user memory too, so if you use a particular graphic regularly, it's even faster. This printer cheque printing mechanism not only doubles cheque processing speed but also virtually eliminates paper jams. This is because it uses two print heads to print on both sides of the cheque in a single pass. And because there's no need to flip the cheque, it's virtually error-free, even with crumpled or folded cheques. 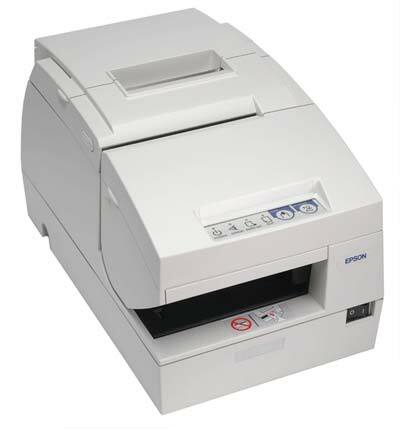 See Anti Fraud Thermal Security Paper for use on the Epson TMH6000III. Pre Printed Water Mark disappears when photo copied!